It's considered one of the highest honors in the military: protecting the Tomb of the Unknown Soldier at Arlington National Cemetery. It’s considered one of the highest honors in the military: protecting the Tomb of the Unknown Soldier at Arlington National Cemetery. These elite volunteers are handpicked and rigorously trained. But now, one of their own has a rare, incurable disease. Military doctors have told former Sentinel Andy Selga, out of the 17 people in the world with his precise diagnosis, he is the only one still alive. Selga has eosinophilic vasculitis isolated to the small bowel. The disease causes painful inflammation of the blood vessels. "It’s emotional. And it was always emotional," he said. Before his diagnosis, he'd been living his dream, walking 21 steps at a time. "It just like pumped me up. I was like, alright, I get to go guard the Unknown Soldiers today. For an entire 26-hour period! Cool!" Selga said. He loved serving as a tomb guard, saying, "This is way bigger than anything I’ve ever done in my life." The number 21 is a symbolic nod to the 21-gun salute, our nation’s highest honor. The Tomb of the Unknown Soldier is guarded 24 hours a day, 365 days a year, and in any weather condition. "To me, the only time I ever felt the true honor and respect was like at nighttime, when it’s like there’s nobody out there and America’s sleeping. But you get a sliver in the night to guard the Unknown Soldiers when nobody else is around and America’s entrusting you to be there," he said. Tomb Guards march 21 steps down the mat, turn and face east for 21 seconds. They turn again and face north for 21 seconds. Then, they take 21 more steps down the mat before repeating the process. It is haunting that Selga was 21 when doctors at Walter Reed National Military Medical Center decided on emergency surgery. They raced to find answers to his relentless abdominal pain. It had come on suddenly while he was walking the mat. "Almost as if somebody took a knife and drove it into my stomach. It wasn’t coming and going. It wasn’t here some days and here other days. It was constant," Selga described. 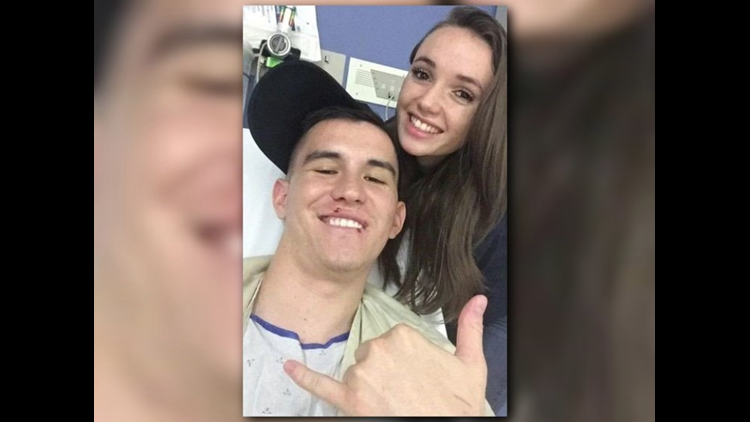 "After the surgery, I wake up and they’re telling me I have eosinophilic vasculitis," he said. The condition is so rare that only two of every one million people in the world are diagnosed with it each year. There is no cure. "I sit back at the end of the day like, ‘Why me?’ What did I do? They ask me questions, ‘Is any of this stuff in your family?’ No. ‘Anywhere? Anywhere in your family?’ No." Selga’s found strength in his wife, Emily. High school sweethearts, the newlyweds tied the knot when Emily was just 17 years old. He was 20. "I got a crash course in adulthood, marriage and caregiving all at once at the age of 17," said Emily. "Marriage is 'til death. He’s my best friend. I’m going to be there til the end. We got the sickness part done! Sickness and in health. I’m really hoping health comes soon!" Despite the constant pain, it’s impossible to find a photograph of Selga where he isn’t smiling. "We’re making the best of it," he said. " I’m gonna live every day to the fullest." The couple was even tossed out of an emergency room once for uncontrollable giggling. "I love my husband!!" Emily laughed. "I appreciate every second I get with him!" And with Emily’s steadfast support, he’s transitioned from a wheelchair to a cane and is now able to walk again, on his own. "I still wake up feeling just like somebody hit me with a bat. On the inside," Selga said. But he’s responding well to treatment. "They expect me to live." He is fighting this disease with the same discipline and energy he mustered to protect the Tomb. Selga was forced to leave the military because of his illness. But recently, he has started an internship at the NASA Goddard Space Flight Center.